I'm feeling pretty crappy today--it's that first day before you really get sick and you know what's coming. I hate that. I wasn't in a sewing mood, but I decided to clean up my space a little. 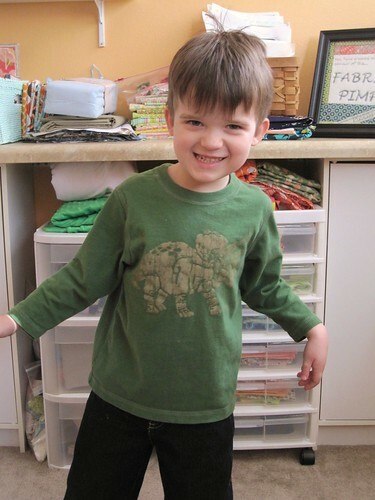 Here are the after pictures (the before pictures were so scary they didn't show up on film!) 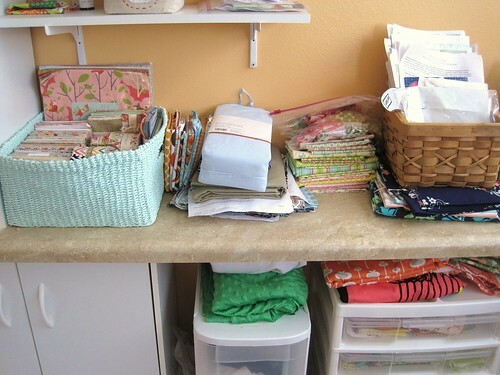 I haven't cleaned up my sewing table/cutting table so that isn't pictured. I'm crossing my fingers I magically get better tonight! I adore your Fabric Pimp sign! And that looks way more than just halfway clean! 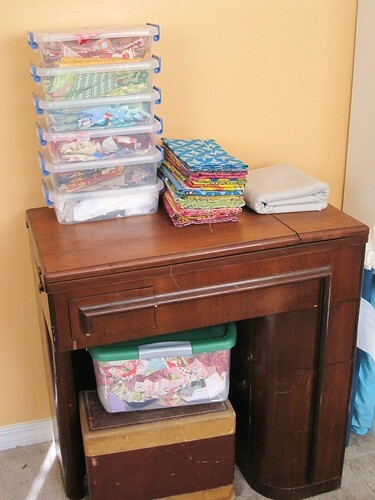 :) I love those cabinets, those look super handy for fabric storage! at least you HAVE a space! my space is my dining room table, unfortunately. which means we don't really eat there. and my very small hall closet is where i keep everything, and it's an absolute mess! 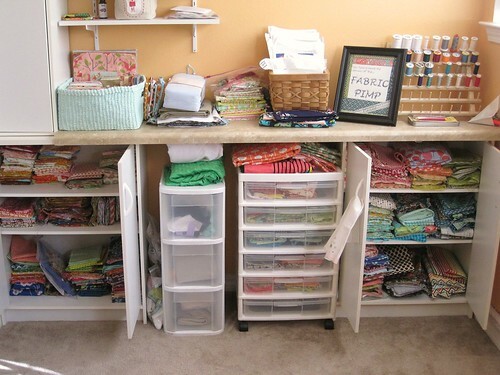 one of the main reasons i'm looking forward to moving is that i'll get my very own craft room! i actually have dreams about it. Hope you feel better soon twinnie! I love the new room! Love your Fabric Pimp sign! Feel better soon! Hope you are feeling better! I took a before picture of my sewing space... I am toying with the thought of posting it to my blog but not until I can take a beautiful after picture... I'm not there yet. But seriously if I post the before picture I might be forced to be on an episode of hoarders: craft edition. maybe i should start a series on my blog with that title... hehehe. You have so much storage space!! So jealous!! Hope you dont get too sick! It is definitely going around everywhere it seems.